When I sat down tonight to check up on fellow Blogtoberfesters!?... (that doesn't sound very nice does it?) Vic threw me a lifeline with the meme 'My Place and Yours'. I was beyond excited because I was really clutching at straws today. So the theme for this week, is On The Shelf. All you have to do to play along, is show something that is 'on the shelf' and link up to Vic's nice blog. I opted for the 'quick and dirty' and snapped a few pics on my phone. If you think you might like to join in with this meme, all the details can be found at Punky & Me. 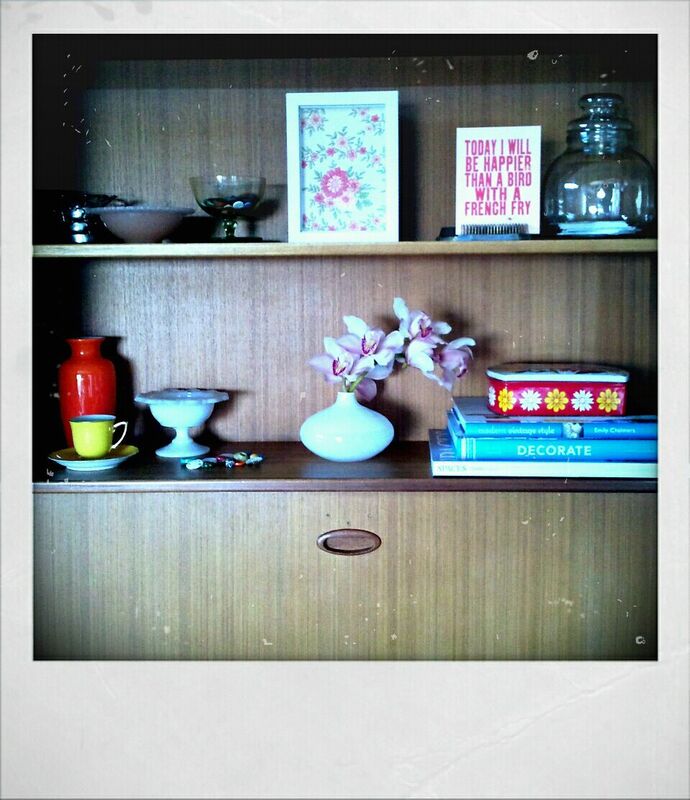 These shelves house some of my op shop treasures as well as a few favourite books that I grab when I find a spare minute. Usually in the afternoon when my littlest is sleeping, I make myself a cup of tea and have a quick read. My favourite little tin was 50c at oppy and it is home to fabric scraps, needle, thread and some metal buttons waiting to be covered. Again, it is something I grab when I don't have a lot of time but need a little crafty quick fix. I bought the little flower frogs a few months ago at a garage sale. I have wanted one for ages and I almost bought one in an antique shop a while back but it was $10. I ummed and ahhhed and eventually left it on the shelf. Anyway, I bought these two for just a dollar each. While I always knew what they were for, I didn't actually know they were called flower frogs until I saw it on a blog somewhere. Whatever did we do before google? 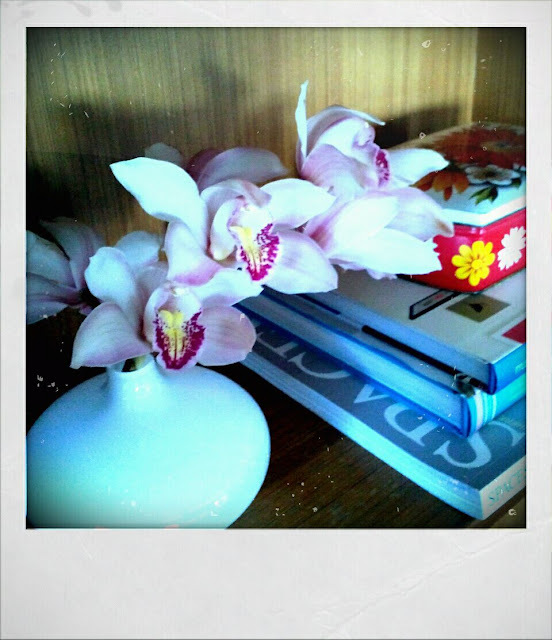 I'm using mine to display photos and cards. I am very possessive about these shelves. They are the only kid free space in the house and they are my happy space. Every other surface is home to toys, pencils, drink bottles, important school notes, 1001 drawings, you get the idea. To see more 'My Place and Yours', visit Punky & Me. You might like to join in too! I love these shelves of yours and in partivular that sweet vase housing the orchids...someone really nice must have bought you that! I was just saying to Lauren @ Owlet that some kid-free adult shelves are such a nice thing to have & you've demonstrated it again here! 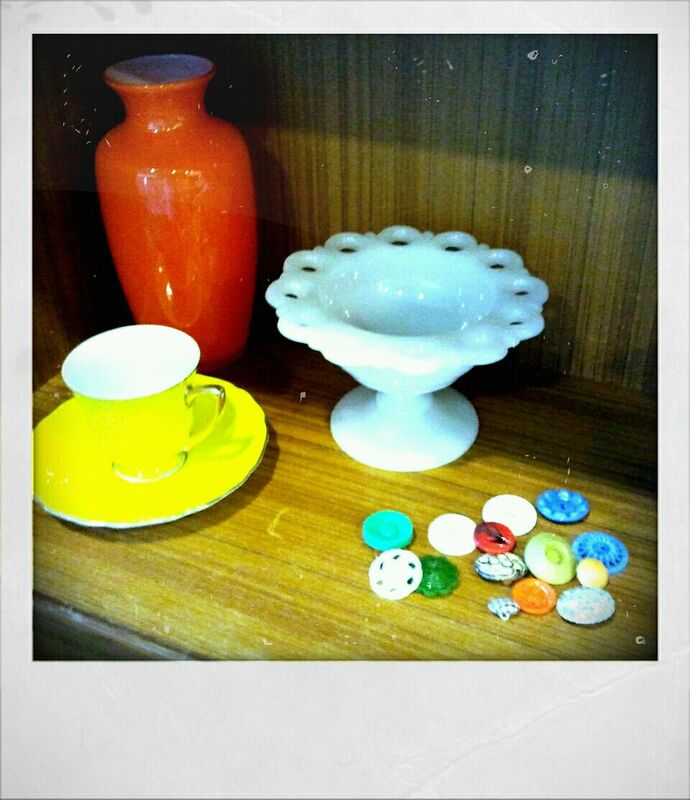 Love the yellow teacup & saucer, so bright & cheery. Thanks so much for joining in; it's nice to be told what to post sometimes, especially right in the middle of blogtoberfest! Oh yes... I get the idea... and I KNOW... children creep into so many spaces it is nice to keep them at bay from one or two nooks and crannies. 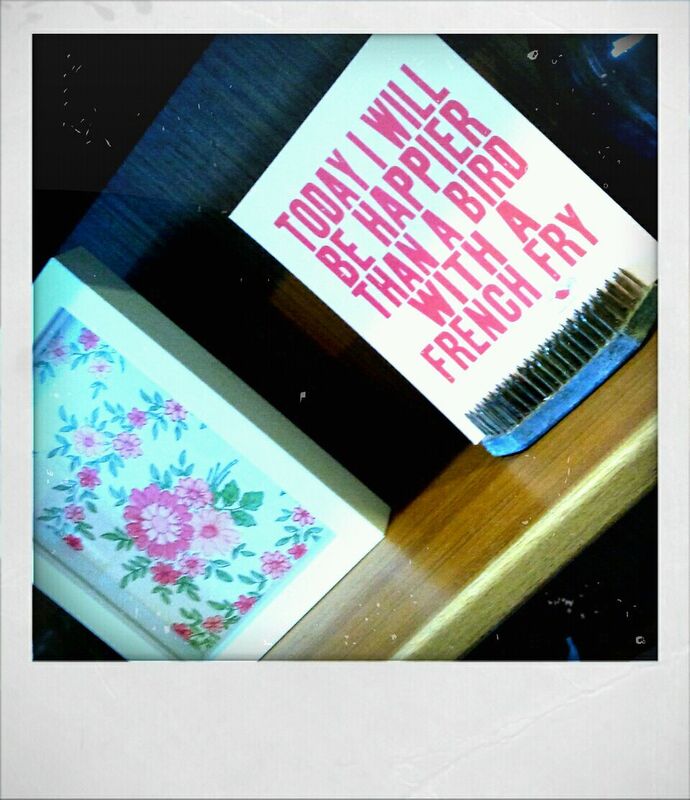 Love that card... my mantra now for tomorrow - happier than a bird with a french fry. Love it. OOOH! I love peeking at people's shelves. :) Thanks for the awesome pics. Love your blog! I poked in from Blogtoberfest. I love the idea of a kid free shelf. All my things were kept under lock and key when the kids were tiny and it is such a shame.You have some really interesting items -love them. I love your happy space. Made me happy just looking at all those beautiful things. Great shelves you have some beautiful pieces there, I really like the flower branch. I have never heard of flower frogs before. You have a gorgeous collection of bits and pieces. I have a thing for yellow teacups at the moment. Must find one of my own somewhere!